The ACL ligament is referred to as the anterior cruciate ligament, which is one of the most commonly damaged ligaments of the knee. ACL injuries commonly occur in athletes or people who exercise regularly. ACL surgery can help treat and repair an injured anterior cruciate ligament. The ACL runs diagonally through the middle of the knee and stops the shin bone (tibia) from sliding out in front of the thigh bone (femur). The ACL ligament is a strong band of tissue that attaches the end of a bone to the beginning of another. The ACL runs from the back of the thigh bone to the front of the shin bone and passes through a special notch within the femur. This notch is called the intercondylar notch and connects the ACL ligaments to a portion of the tibia known as the tibial spine. The ACL controls how far the shin bone moves beneath the thigh bone. If the shin bone moves too far, the ACL may tear or rupture due to the strain. When the knee is extended, the ACL is the first ligament that tightens and reduces further motion. Hyperextending the knee beyond this point can lead to an ACL tear. What causes an ACL tear or injury? One of the most common ways to tear or injure the ACL is by playing sports. Any sport or activity that requires the foot to be on the ground while the body changes direction quickly can lead to a higher likelihood of an ACL tear. An ACL tear commonly occurs when the knee or leg experiences a violent twist, movement, or hyperextends. Immediately after tearing your ACL, you might hear a popping or clicking sensation, which is commonly followed by a feeling of your leg giving out and being unable to support your weight. The most common ACL symptom is a popping sensation or sound followed by leg weakness. Often times, the knee may become inflamed or swell after suffering an ACL tear. A feeling of the knee slipping backward may also be present after an injury to the ACL. The swelling and discomfort from an ACL tear usually subsides within 2-4 weeks from the initial injury. Despite the reduction in pain or swelling, you still may experience knee weakness or instability. If left untreated, an unstable knee may be more likely to develop arthritis. How can Dr. Rozbruch diagnose an ACL tear? In most cases, Dr. Rozbruch can diagnose an ACL tear using information about your medical history and a physical examination. If swelling occurs the day of your ACL injury, it is often safe to assume that the inflammation is due to blood within the joint. Swelling that is present the day after your ACL injury may be fluid that is from the inflammatory response. Dr. Rozbruch may use a needle to remove the excess fluid from the knee, reducing the overall swelling and alleviating some discomfort. If blood is present in the fluid, there is a likely chance that it is a sign of an ACL tear. This fluid may also help Dr. Rozbruch understand if the cartilage at the surface of the knee joint was damaged. A physical examination will help Dr. Rozbruch determine the extent of damage your ACL might have sustained. If Dr. Rozbruch requires additional information, he may order a knee X-ray to ensure that the knee has not fractured. An MRI of the knee can also help diagnose a torn ACL. If Dr. Rozbruch is still unsure about your particular diagnosis, an arthroscopic procedure may be performed. This arthroscope is inserted through a small incision and has a camera at its end. The images gained from the arthroscope will appear on a monitor, providing Dr. Rozbruch with a live view of the inside of your knee. What ACL tear treatments are available? Initially, Dr. Rozbruch will attempt to treat your torn ACL nonsurgically if he feels you are a proper candidate. ACL surgery is typically reserved for more severe cases to avoid patients undergoing unnecessary surgery. Rest and oral medications may be prescribed to allow your ACL time to heal. Crutches may also help you walk without straining your ACL further. In some cases, the knee may need to be drained if substantial swelling or inflammation is occurring. Physical therapy is a common ACL treatment that is often prescribed once the knee has begun healing. Light exercises can help you regain knee mobility and a wider range of motion. The first type of exercises performed are designed to increase your knee’s range of motion, which can promote healing. As your knee heels after a nonsurgical ACL tear treatment, you may begin to incorporate light strength training to improve control over your leg muscles. Specifically designed exercises will help you strengthen key points in the knee and leg. For some patients, an ACL knee brace may be suggested. An ACL brace is specifically designed to comfortably fit the contours of your leg and knee. An ACL brace can improve knee stability and reduce the potential for additional damage to occur. Additionally, ACL braces can also provide support and reduce knee weakness. 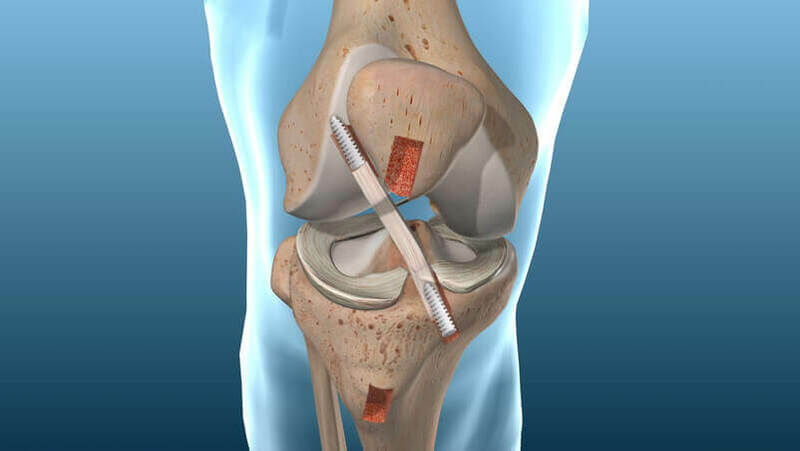 What ACL tear surgeries are available? While some ACL tears may be treated nonsurgically, some patients may require ACL surgery. Patients who experience knee instability that does not improve with a knee brace or physical therapy may need to undergo ACL surgery. Dr. Rozbruch may suggest physical therapy sessions before and after ACL surgery to ensure the knee heals as well as it can. Common ACL surgeries include arthroscopic ACL surgery, ACL surgery with a hamstring graft, a patellar graft for ACL, and allograft ACL reconstruction. The majority of ACL surgeries involve replacing a torn ACL with a graft from another ligament or tendon. This type of ACL surgery is often performed with an arthroscope, which is a small tube with a camera on the end. The internal images of your knee seen through an arthroscope will be displayed on a monitor in the room, giving Dr. Rozbruch a live view of your knee. This type of ACL surgery does not require the actual knee joint to be surgically opened. The arthroscope is used to locate the damaged ACL, which will then be repaired. Arthroscopic ACL surgery is less invasive than open knee surgery, so the majority of patients are able to return home the same day as their surgery. Dr. Rozbruch may take a graft from the hamstring to replace the damaged ACL. A portion of the hamstring is taken during this type of ACL surgery. Dr. Rozbruch will take more than needed to ensure the graft will be successful. Hamstring grafts are generally favored because the hamstrings do regenerate with time. Once the damaged ACL is removed, a small tunnel will be made in the femur to the knee joint and the tibia to the knee joint. The hamstring graft will be prepared and placed through the tunnel in the femur. A device will help pull the hamstring graft through the lower tunnel of the tibia. The hamstring will be pulled slightly until the elasticity of the ACL joint is approximately achieved. A small rectangular device will securely hold the top of the hamstring graft into the femur bone and prohibit the hamstring graft from falling down the tunnel. The bottom of the graft will be anchored with a bio-absorbable screw. The term bio-absorbable means that the screw will slowly be incorporated into the bone with time. At the end of your ACL surgery with a hamstring graft, any incision will be stitched closed. Similar to a hamstring graft, a patellar graft can also be used during ACL surgery. The patellar tendon extends from the front of your knee (patella) to the top of the tibia. The middle portion of the tendon is removed, including part of the bone from the patella and part of the bone from the tibia. The patellar tendon is now in 2 separate sections. Dr. Rozbruch will stitch the patellar tendon together to correct the defect made when harvesting the patellar graft. After the joint is inspected with an arthroscope, a small tunnel will be made in the upper tibia, which will create an opening where the ACL would attach to the tibia. Another tunnel will be made through the femur where the ACL would attach. To ensure proper positioning of the tunnels, a guide pin will be used. The guide pin will be pulled through the tunnels. With it, the patellar graft will be pulled through the tunnels, as well. A screw will be placed at the exit of the femoral tunnel within the knee joint. This screw will hold the patellar graft in place. Another screw will be placed on the outside of the tibial tunnel, securing the rest of the patellar graft. Once each end of the patellar graft has been firmly secured, Dr. Rozbruch will close any external incisions. During ACL reconstruction, an allograft may be used to replace a damaged tendon. An allograft is tissue that is harvested from another individual. This allograft material may be harvested from the tendon of the tibia, patella, hamstring, or Achilles. Many allografts use patellar tissue, as this tissue is often easier to place correctly. Another advantage of a patellar allograft is that Dr. Rozbruch will not have to disturb any surrounding tissues or structures within the knee. 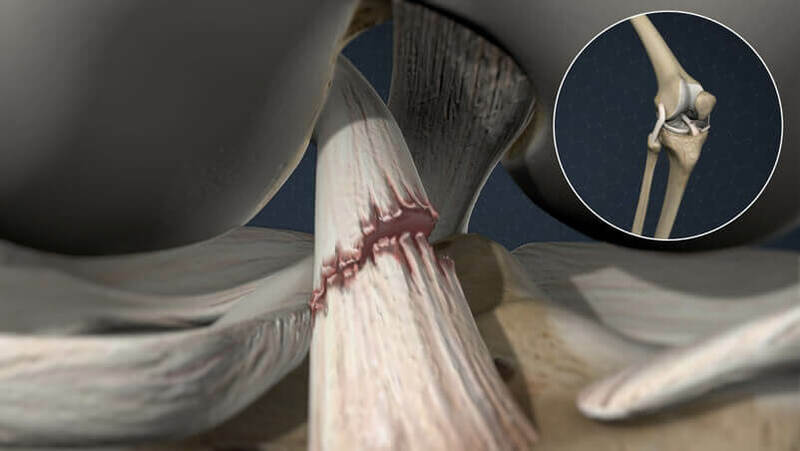 Allograft ACL reconstruction may be a shorter ACL surgery because Dr. Rozbruch does not have to manually remove the graft from your body before beginning your ACL repair. What should I expect after an ACL treatment or surgery? Following a nonsurgical ACL treatment, recovery may take up to 6-8 weeks. During this time, physical therapy can help improve the strength and mobility of the knee and leg. On the other hand, physical therapy after an ACL surgery may last up to 4-6 months to ensure an ACL graft is adjusting properly. During the first few weeks following torn ACL surgery, you may visit with your physical therapist several times a week. If your ACL tear surgery and recovery go well, you may be able to practice physical therapy exercises alone at home and meet with your physical therapist every few weeks for the remaining time. How can I learn more about ACL surgery? To learn more about ACL surgery, please request an appointment online or call Dr. Rozbruch’s orthopedic office in NYC at 212-744-9857. Prior to an office visit, please fill out Dr. Rozbruch’s patient forms to expedite your first visit.